O God, who for the relief of the poor and the formation of the clergy endowed the Priest Saint Vincent de Paul with apostolic virtues, grant, we pray, that, afire with that same spirit, we may love what he loved and put into practice what he taught. Through our Lord Jesus Christ, your Son, who lives and reigns with you in the unity of the Holy Spirit, one God, for ever and ever. 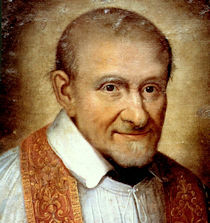 St. Vincent de Paul (1576 - 1660) was born in Gascony, France, and died in Paris. He studied theology at Toulouse and was ordained a priest in 1600. As a young priest he fell into the hands of Mohammedan pirates who carried him off to Africa. After his return to France he became successively parish priest, grand almoner of the galley slaves, and spiritual director of the Visitation nuns. He founded the Congregation of the Priests of the Mission or Lazarists to preach especially to country people. With the help of Louise de Marillac he established the Congregation of the Sisters of Charity to care for young girls, for the needy, sick, and foundlings. He died at St. Lazarus's which was the center of his Congregation. Leo XIII proclaimed him special patron of charitable institutions. According to the 1962 Missal of St. John XXIII the Extraordinary Form of the Roman Rite, today is the feast of Sts. Cosmas and Damian which is observed on September 26 in the Ordinary Form. St. Vincent de Paul was a great apostle of charity, and brought a great revival of the priesthood in the 17th century. He was born near Dax in the Landes (France) in 1581. As a young priest he was captured by Moorish pirates who carried him to Africa. He was sold into slavery, but freed in 1607 when he converted his owner. Having returned to France, he became successively a parish priest and chaplain to the galley-slaves. He founded a religious Congregation under the title of Priests of the Mission or Lazarists (now known as Vincentians), and he bound them by a special way to undertake the apostolic work of charity; he sent them to preach missions, especially to the ignorant peasants of that time, and to establish seminaries. In order to help poor girls, invalids, and the insane, sick and unemployed, he and St. Louise de Marillac founded the Congregation of the Daughters of Charity, now better known as the Sisters of St. Vincent. St. Vincent worked tirelessly to help those in need: the impoverished, the sick, the enslaved, the abandoned, the ignored. He died in 1660 at St. Lazarus's house, Paris. His motto: "God sees you." "Let us love God; but at the price of our hands and sweat of our face." Patron: charitable societies; horses; hospitals; leprosy; lost articles; prisoners; volunteers; spiritual help; Saint Vincent de Paul Societies; Vincentian Service Corps; Madagascar; diocese of Richmond, Virginia. Symbols: 16th century cleric performing act of charity; priest surrounded by the Sisters of Charity; book with heart; model of an orphanage or hospital; model of a hospice; priest with child in his arms. Find out more about the Vincent de Paul Society near you, see if you can participate. Find out more about the two orders founded by St. Vincent. Other people to find out more about: St. Louise de Marillac, Bl. Frederic Ozanam and St. Francis de Sales. Learn what France was like during St. Vincent's life. At that war-torn time, the lives of peasants were far removed from those of the nobility. Make a banner or poster with St. Vincent's motto to remind us of God's presence.